The Future is Here - a look at complementary and alternative medicine usage in the U.S. 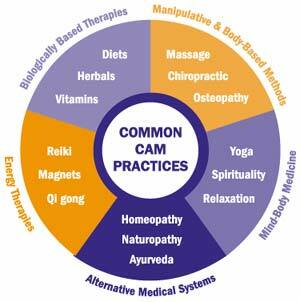 In the US, the designation 'Complementary and Alternative Medicine (CAM)' has been assigned to group the many and varied models of healthcare that do not fall under conventional models. Research into the benefits and usage of CAM is being performed today at many levels of government and by insurance companies, business and healthcare providers. According to a study (1) by the Institute of Medicine (IOM) in 2003, "The total number of visits to CAM providers increased by 47 percent from 1990 to 1997 and the total visits to CAM providers exceeded total visits to all primary care physicians in 1997". In a survey (2) conducted by the US National Institutes of Health (NIH) it was found that 36% of US adults are using some form of CAM and when megavitamin therapy and prayer are included, the number rises to 62%. 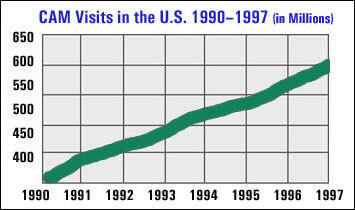 The Institute of Medicine study further states, "The authors concluded that CAM use and expenditures increased substantially between 1990 and 1997, attributable primarily to an increase in the proportion of the population seeking CAM therapies, rather than increased visits per patient". What are the reasons for the turn to alternative methods for healthcare? A study (3) by JA Astin in the Journal of American Medicine concludes that Americans are turning to CAM largely "because they find their health care alternatives to be more congruent with their own values, beliefs and philosophical orientation towards health and life". There is also a healthcare crisis in the US where healthcare costs continue to rise sharply. In a September 27, 2004 Washington Post article (4) "...workers' costs for health insurance have risen by 36 percent since 2000, dwarfing the average 12.4 percent increase in earnings..." during the same period. In 2002 business health costs rose at 15% per year and then approximately 10% in 2003 according to a study of nearly 3,000 employers by Mercer Human Resource Consulting. One reason for the slowdown in cost increases for businesses appears to be that they have shifted the burden to their employees. PriceWaterhouseCoopers reported in a study (5) in Apr., 2003, that "86% of employees face increased healthcare program contributions and 72% face raised deductibles", according to "Management Barometer" a quarterly survey of top executives in large, multinational businesses, in a cross-section of industries. These studies show that people in the US continue to choose Complementary and Alternative methods due to personal preference and due to the increasing costs of conventional healthcare. You can bet that these numbers have caught the attention of many in government, conventional healthcare, academia and insurance research departments. According to the IOM study, estimated expenditures for CAM professional services increased by 45% exclusive of inflation and in 1997 were estimated at $21.2 billion dollars in the US. What are the signs that the future is here? In the past, alternative providers of healthcare knew that they were helping people be more well, but when they tried to explain what they were doing, there was disbelief from the mainstream and they were often ignored. Well, today they are getting a lot of attention at many levels. The University of Pittsburgh maintains an online database (6) of hospitals and other healthcare facilities that have active complementary and alternative medicine research programs. These facilities are located all around the U.S On the eTouch for Health (8), we have used these definitions to show their inclusion or exclusion from the TFH synthesis that eTouch is based upon. It should be obvious with all of these active research programs focused on CAM that the future of healthcare is changing rapidly in the US and the future has arrived. For the alternative healthcare provider, these changes provide both new opportunities and an increased level of responsibility. The "Health Freedom Bills" (9) that are being passed in some states in the US are a good example of this. These bills recognize the existence of the CAM providers and their beneficial services, but also provide stricter guidelines under which they can be practiced and the services delivered. The essential spirit of the Health Freedom Bills is that the individual can choose the healthcare intervention that they choose and expect to be fully informed of the theory of the services, the risks and the training and experience of the person delivering the services. For the alternative provider that has struggled for recognition for so many years (and those that did not want recognition), you are now getting getting the recognition and the future has arrived. We are in a transitionary period and there is much that those involved in CAM can do to further the adoptance and practice of these modalities. As the National Institute of Health (NIH) and the NIH National Center for Complementary and Alternative Medicine (NCCAM) work to define and understand the diversity of the alternative methods, it will be important that the Touch for Health Kinesiology and other kinesiologies and energy modalities are properly included in the studies. For example, in the chart at the top of the page, NCCAM only has Reiki, Magnets and Qi gong in the Energy Therapies category. Where are TFH and the energy kinesiologies? One way that everyone that reads this newsletter can be proactive is to be aware of the studies that are being conducted in medical and academic organizations in your area and make inquiries about the modalities being researched. If Touch for Health and the energy kinesiologies are not being included and evaluated, make a suggestion that they should be and be prepared to provide concise background information or sources for this information. Dr. John Thie, DC, founder of Touch for Health and now the Research Director for the International Kinesiology College has stressed the importance of formal research as we greet the future and work to have TFH included as an accepted modality in the new face of healthcare. As a result, the eTouch for Health software was designed to collect information that can later be analyzed in formal research projects when submitted by research participants. eTouch will be an active component in the research efforts as we go into the future. For the practitioner, along with the new opportunities and freedoms, there will be increased pressure to explain theories, track information and demonstrate results. We are currently working on a research project with the IKC and Dr. Thie that will begin to provide data for researchers around the world that are researching the benefits of energy balancing. Please stay tuned. The National Academies of Medicine report stated that total out-of-pocket expenditures relating to CAM therapies were "conservatively estimated at $27.0 billion. This is comparable to the projected out-of-pocket expenditures for all US Physician services". These figures are impressive and represent the increased level of acceptance of CAM in the US Truly, the future has arrived and represents both new opportunities and a new level of responsibility as increased levels of focus is put upon the complementary and alternative modalities. Our advice, be aware of these changes and do research in your local areas to see how CAM is being understood, researched, implemented and legislated. You might be able to offer advice that will be important to the new future of healthcare. Please support Dr. Thie's research efforts and those here at eTouch for Health as we work to make the future a better place for everyone. E-mail either Dr. Thie or us if you have a suggestion of ways to further the research or if you see an opportunity for a formal research project in your area. Also support the work in your area to craft fair Health Freedom Bills. Most importantly, know that the future is here. Touch for Health is a safe, cost-effective and relatively easy way to help people live a healthier, more active and more fulfilling life. Live your life to its fullest and know that you can help others find their wholeness. Share your knowledge and help others to help themselves and others. And please send a letter or e-mail to let us know how you are doing. (5) - PriceWaterhouseCoopers PwC's "Trendsetter Barometer April 1, 2003, Rising Healthcare Costs Making Employers and Employees Sick "